The company that sold the apartment to the mother of Delyan Dobrev, the former lawmaker from the ruling party Citizens for European Development of Bulgaria (GERB) and former Energy Minister, has a Haskovo-based co-owner with a controversial reputation. Other prominent people from the southern city of Haskovo have bought apartments at simulative prices from this company. Despite the high demand for new construction in the Bulgarian capital Sofia, the balance sheet of the company does not add up if all properties have been sold at the prices declared in the Property Register, a check by Bivol reveals. “Should lawmakers be living in shacks?” GERB MP Georgi Markov (also known with the codenames “Nikolay” and “Stefan” as an agent and collaborator of the Communist era secret services) asked the National Assembly on the occasion of the resignation of MP Delyan Dobrev after an investigation by Bivol. Earlier on the same day, in an interview with bTV, Dobrev explained that he had been renting an apartment of 200 square meters from his mother’s company and had been paying rent in the amount of BGN 1,200 a month. He refused to say exactly where the apartment is located and the TV channel did not show it, although in a similar case it showed footage of the apartment and the terrace of the Chairman of the Committee for Combatting Corruption and the withdrawal of illegally acquired property (KPKONPI) (sic) Plamen Georgiev. A few days ago, Bivol published the facts from Dobrev’s case. They involve two apartments on the top floor of a new building in the “Manastirski Livadi” district with terraces and views of the Vitosha Mountain. Dobrev probably omitted the terrace area when talking about the 200 square meters, because one of the apartments has an area of 284 square meters and the other – 42 square meters, or a total of 326 square meters. There are also three garages with a total area of 51 square meters. As Bivol wrote, these properties had been acquired “off-plan” by Delyan Dobrev’s cousin Rositsa Gargova and her husband Daniel Gargov for BGN 201,900 (an average of EUR 280 per square meter, but the garages had been cheaper). Two years later, the finished apartments were resold to the company “Iconus”, which had been owned by Dobrev and now belongs to his mother, for BGN 400,000 without VAT, but with a 10-year repayment clause. To date, “Iconus” has paid to the cousin’s family only BGN 40,000 plus VAT of in the amount of BGN 80,000, but the latter is subject to reimbursement by the State. The tax assessment of the properties is BGN 380,476. Delyan Dobrev claims that these were market prices, but during the same period, properties in the same building had been sold for double the price per square meter, research by Bivol showed. Indeed, the sales had not been that many, but they are a fact. Anyway, that money remains in the family, and it turns out the apartment has been repaid from the taxpayer’s pocket because Dobrev, as a lawmaker who is not from Sofia, is entitled to additional funds for a home in the capital. In fact, in Dobrev’s declaration to the KPKONPI for 2018, he has written that he lives on 100 square meters in “Manastirski Livadi” for BGN 950 per month. The company “Inteh Investment” was incorporated on February 9, 2016, with partners “New Home” Ltd. and “Neoprofit” Ltd., each with a capital of BGN 1,000. “New Home” is a design company, owned by Nikolay Spassov Ivanov, while “Neoprofit” is a company of Delcho Pehlivanov from Haskovo. A month after the creation of “Inteh”, he transferred “Neoprofil” to his mother Maria-Anthonia Pehlivanova. Delcho Pehlivanov is a business partner with the mayor of Mineralni Bani (Mineral Baths, SPA) – Haskovo, Myumyun Iskander, from the party Movement for Rights and Freedoms (DPS), largely representing the Bulgarian Muslim minority. His assets include a large number of lucrative land swaps in Haskovo and the nearby town of Harmanli, carried out in 2009 at the end of the term of the Triple Coalition government in which the DPS participated. According to media reports, a while ago, two men have attacked and beaten him in broad daylight in Haskovo. Shortly after its incorporation, “Inteh Investment” acquired a land plot in “Manastirski Livadi” for BGN 561,049 from private individuals. Five months later, it obtained from the mayor of the “Vitosha” district a building permit for an area of 3,875 square meters (number 231, from August 9, 2016) and began to sell apartments “off-plan”. On the company’s Facebook page, one can follow the construction process, from the groundbreaking to the landscaping that ended in August 2018 when the first occupants arrived. While building in “Manastirski Livadi”, “Inteh Investment” had not suffered from a lack of liquidity, although there is no evidence of mortgaging the land or a special pledge of the company because of a bank loan. In February 2018, the company acquired a second plot for BGN 1,208,702 in the “Krastova Vada” district, where it plans to build another residential building. The “off-plan” sale has already started and 12 apartments, with a declared value of BGN 1.36 million, have been sold so far. Petyo Angelov Ivanov – Executive Director of the Bulgarian Energy Holding (BEH), a classmate of Delyan Dobrev, has acquired a penthouse of 209 square meters for just BGN 94,050 in the same building as Delyan Dobrev’s mother, but at the opposite end. The apartment is on the highest floor and has a large terrace. 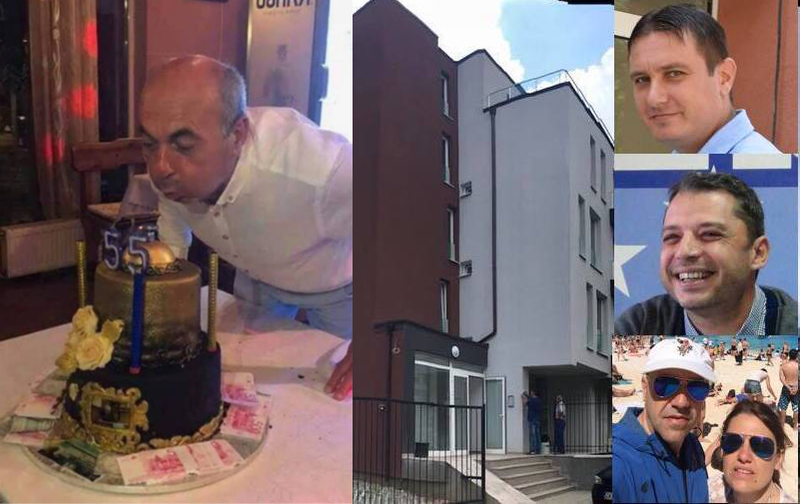 The two daughters of the Haskovo MP from GERB Georgi Stankov (on the headline photo), who made headlines because of his birthday cake topped with euro wads, have bought “off-plan” housing in the future building in “Krastova Vada”. Tanya Stankova, who is a legal adviser to the municipality of Harmanli, has paid BGN 51,305 for an apartment of 56 square meters and a garage of 13 square meters, while the other daughter, Vessela Russeva, has paid BGN 53,305 for a similar property. The Director of the duty-free Svilengrad border area Mavri Indzhebazov has bought an apartment of 63.7 square meters for BGN 72,216. Lawyer Tanya Kovanlashka, who has bought a right to build for 87.3 square meters and for a garage of 13.6 square meters for the very low BGN 115 014, also has a Haskovo connection. She has been an adviser to Zahari Zhelyazkov at the Privatization Agency. He is a former Haskovo judge and considered to be close to the DPS. Haskovo lawyer Philip Mihailov Dimov has broken the cheap housing record with BGN 28,625 for an apartment 63 square meters and a garage of 18 square meters. His wife Magdalena has also taken 50 square meters and a garage for BGN 22,580. Later, Philip Dimov has bought a garage of 13 square meters for BGN 11,734, which is indicative of the simulated price of the apartments. The Director of “Neochim” Dimcho Staykov Georgiev is a partner of Delyan Dobrev’s mother – Zlatka Dobreva in the company “Skilalas” and also part of Gargov’s business circle, which has won tens of millions in public procurement contracts. He has bought two apartments (51 square meters and 77 square meters) in the “Manastirski Livadi” building and two garages for BGN 79,764 from “Inteh”. Georgiev has also bought a right to build for an apartment of 136 square meters and a garage in the planned building in “Krastova Vada” with declared material interest for the significant, compared to the others, amount of BGN 319,051. The latter is actually the real market price of the new developments in the area – about EUR 1,200 per square meter. This deal concluded by the close to Dobrev’s family businessman refutes all the “fairy tales” of buying a right to build at ridiculous prices. To build in Sofia at a loss? According to data from the Property Register, until now, “Inteh Investment” has sold apartments and garages totaling BGN 2.5 million in the building in “Manastirski Livadi”. If it is assumed that the cost of construction per square meter is BGN 600 (a quite conservative one), then, for 3,875 square meters, the investor should pay BGN 2.3 million. By adding the land price – BGN 561,049, the bill becomes BGN 2.86 million or BGN 360,000 more than the sales. One explanation for this not very profitable investment is that not all properties had been listed at their actual market price, which lowers the cost of local taxes and fees. Against this backdrop, it would be logical for the KPKONPI to carry out the same detailed investigation of “Inteh Investment” as the investigation of the construction company “Arteks”, launched after Free Europe and the Anti-Corruption Fund revealed the cheap luxury apartment of former GERB MP Tsvetan Tsvetanov. So far, despite the noise surrounding Delyan Dobrev’s resignation, there is no indication of such activity by the anti-corruption body, also shaken by scandals associated with its Chairman Plamen Georgiev and his Deputy Anton Slavchev.